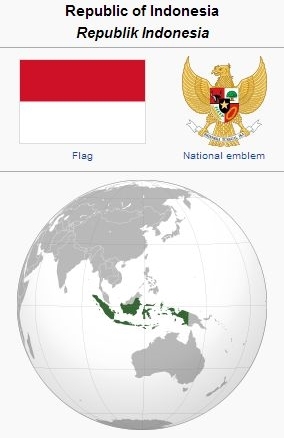 The Republic of Indonesia is located in Southeast Asia. The country is an archipelago of 13,466 islands with a total area of 1,904,569 km2 (735,358 square miles). In 2011 the population was 237,424,363, making it the 4th most populous country in the world. The country shares land borders with Papua New Guinea, East Timor, and Malaysia. Other neighboring countries include Singapore, the Philippines, Australia, Palau, and the Indian territory of the Andaman and Nicobar Islands. Austronesian peoples, who form the majority of the modern population, migrated to South East Asia from Taiwan. They arrived in Indonesia around 2000 BCE, and as they spread through the archipelago, pushed the indigenous Melanesian peoples to the far eastern regions. Hinduism and Mahayana Buddhism arrived in Indonesia in the 4th and 5th century, as trade with India intensified. Although Muslim traders first traveled through Southeast Asia early in the Islamic era, the earliest evidence of Islamized populations in Indonesia dates to the 13th century in northern Sumatra. Other Indonesian areas gradually adopted Islam, and it was the dominant religion in Java and Sumatra by the end of the 16th century. For the most part, Islam overlaid and mixed with existing cultural and religious influences, which shaped the predominant form of Islam in Indonesia, particularly in Java. Portuguese traders first made contact with the peoples of Indonesia in 1512. They were followed by Dutch and British traders. The Dutch East India Company, established in 1602, became the dominant European power in the region. In 1800, the company was dissolved and the Dutch East Indies was established as a Dutch colony. Dutch rule was ended during World War II when the Japanese occupied the country. Independence was declared after the surrender of Japan in August 1945. Indonesia consists of approximately 300 distinct native ethnic groups and 742 different languages and dialects. The largest and politically dominant ethnic group are the Javanese, comprising 42% of the population. They are followed by the Sundanese, ethnic Malays, and Madurese. Chinese Indonesians comprise only 3-4% of the population, but are very influential economically. Indonesia is the world's most populous Muslim-majority nation at 87.2% in 2010. The majority are Sunni Muslims. Other religious groups include: Christians, 9%; Hindus, 3%; Buddhist and others, 2%. Indonesia declared itself an independent nation in 1945 after 450 years of increasingly pervasive colonial rule under first the Portuguese and then the Dutch. During its first quarter century of independence, Indonesia was plagued with several immense problems. First was five years of armed struggle to resist Dutch efforts to reassert control after the Japanese occupation during World War II. Second was the effort to establish a democratic form of government that would function in that context. Third was the struggle to gain control of the divergent forces impinging on the development of the economy of the young republic. Fourth was the struggle to forge some kind of national unity in the face of immense diversity and forces that threatened to tear the young republic apart. Before Europeans arrived in the archipelago at the end of the 15th century, a whole succession of Indonesian kingdoms based in Java and Sumatra ruled areas that sometimes extended as far as the expanse of the modern nation state of Indonesia. The most notable of these were Sriwijaya, a maritime power based not far from present-day Palembang in central eastern Sumatra, and Mojopahit, the agriculturally based kingdom of Java which succeeded in becoming a great maritime power as well. Some of these Indonesian kingdoms have left a heritage of monumental architecture treasured among the architectural and artistic wonders of the world. The vast majority of Indonesia's people are identified formally as Muslims. Muslim traders began to appear in the port towns of the archipelago by the 7th century after Christ. They established a series of petty kingdoms along the coasts of Sumatra and the Malay Peninsula. But Islam was not able to penetrate into Javanese society and displace the powerful Shiva-Buddhist Mojopahit kingdom until the 14th century, when a series of Islamic kingdoms began. Under Dutch colonial rule it was assumed that the people of Java were Muslims, and government regulations required the people to marry by Islamic law and rites. However, Islam in much of Indonesia has been described as a "thin and flaking glaze" overlaying not only older Hindu and Buddhist religious traditions, but, more importantly, the aboriginal religions of the Indonesian peoples. The world religions (Buddhism, Hinduism, Islam, Christianity that have been introduced into Indonesia have in many respects undergone a process which, in the case of Java, scholars call "javanization." In a large measure this can be described as the adaptation of the external forms of the world religions to the expression of the aboriginal religious impulses of the Javanese people. However Islam in Indonesia is undergoing significant revitalization with the result that there is continuing interest in converting the religiously pluralistic republic of Indonesia into an Islamic republic. Christianity, according to some ancient sources, was already present in Indonesia by the 7th century. Whatever Christian presence may have been established there—ostensibly by missionaries of the ancient Nestorian Church of the East—Indonesian Christian communities in the 21st century can be traced only as far back as the coming of Portuguese Roman Catholics at the end of the 15th century. At the time of the displacement of the Portuguese by the Dutch at the turn of the 17th c., most of the Roman Catholic communities in the archipelago were transformed into Protestant communities. During the first 100 years of rule by the Dutch East India Company, Christian ministry in the archipelago was limited largely to the pastoral care of European Christians present there. Significant mission activity in the archipelago did not begin until the 19th century. Furthermore, because the Dutch colonial administration did not want to disturb business operations among Muslims, it prohibited evangelization in certain areas. Indonesia is a place of historical importance in the story of Mennonite overseas mission. The first Mennonite mission society was established in The Netherlands in 1847 specifically to send missionaries to The Netherlands East Indies. This society sent its first missionary, Pieter Jansz (1820-1904), to Indonesia in 1851. He, together with colleagues Thomas Doyer, N. D. Schuurmans, and Hildebrand Klinkert, brought about the formation of a mission church among the Javanese in the area near the Muria mountain along the coast of north central Java. Jansz and Klinkert made extraordinary contributions to the translation of the Bible into the Javanese and Malay languages, respectively. Beginning in the 1880s the development of that mission church was characterized by (1) the formation of Christian agricultural colonies, a special approach to mission; (2) the incorporation of a large indigenous Christian movement that had arisen under the leadership of Javanese evangelist Kyai Ibrahim Tunggul Wulung (d. 1885); and (3) the recruitment of most mission personnel from the Kirchen-Gemeinden Mennonites in south Russia. Before any of the Mennonite missionaries from Russia began to work in Java, the Dutch Mennonite Mission Society opened an entirely new field for them in Mandailing, the southernmost part of the province of North Sumatra. The church that developed in Mandailing was turned over to the larger Protestant mission church in that province in the 1930s as a result of the cutoff of the support base for that enterprise after the Russian Revolution. Several of those congregations regrouped in the 1950s to form the Gereja Mennonit Protestan Indonesia (Indonesian Protestant Mennonite Church), which interacted with the Mennonite churches in Java and Mennonite Central Committee. However, in the mid-1970s, at the time of the formation of the Angkola-Mandailing-speaking Angkola Christian Batak Protestant Church, the Gereja Mennonit Protestan Indonesia, because of its small size, was incorporated into the new body. Special provision was made for the continuation of Mennonite practices in congregations of Mennonite origin. Very early in his work Pieter Jansz showed interest in Indonesians of Chinese descent. He worked with them himself. He invited Chinese evangelists to come and minister among them. By the turn of this century, the mission began recruiting people to work especially among the Chinese. However little headway was achieved, partly because converts of this group were expected to be incorporated into Javanese congregations. In 1920 a new Chinese Christian fellowship was formed at the instigation of a businessman who became Christian in the town of Kudus (Tee Siem Tat). This group became identified with the Mennonite mission, although it quickly moved toward independence in 1926. Today this group is called the Persatuan Gereja-Gereja Kristen Muria Indonesia (Muria Christian Church of Indonesia). The main body of the (predominantly Javanese) Mennonite mission church in Java was organized in 1940 into a conference whose original Javanese language name was Patunggilanipun para Pasamuan Kristen Tata Injil ing wengkon Kabupaten Kudus, Pati, Jepara (Union of Gospel-patterned Christian Congregations in Kudus, Pati, and Jepara Counties). In 1988 it is called the Gereja Injili di Tanah Jawa (Evangelical Church of Java). It had some 60 mature congregations with 105 branches and numbers ca. 50,000 adherents, including children. In 2003 there were 96 congregations with 43,000 members. Mennonites in Indonesia have a history of ecumenical involvement that can be traced back to Pieter Jansz's role as "Elder Missionary" leader of the ecumenical missions conference during his lengthy retirement from active mission work. Both Mennonite churches in Java have from early on been involved as members of the Indonesian Council (later Communion) of Churches. Both of them are involved deeply in various ecumenical enterprises most notably in a university and seminary. Mennonites have for decades played lead roles in the development of both Satya Wacana Christian University in Salatiga and Duta Wacana Theological Seminary (now also a university) in Yogyakarta. The Doopsgezinde Zendingsraad (Dutch Mennonite Mission Board), as part of the Europäisches Mennonitisches Evangelisationskomitee (European Mennonite Mission Board), returned to Indonesia after the war and revolution of the 1940s placing personnel to work primarily with the Evangelical Church of Java and with a new ecumenical work being started in Irian Jaya (West New Guinea). 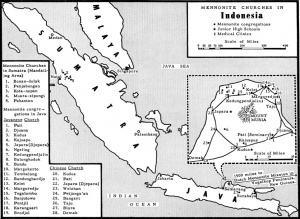 In 1947 the North American Mennonite Central Committee (MCC) began to make contact with and assist the Mennonite churches in Java who were cut off from the outside world by war and revolution. Working for the most part in very close partnership with those churches, MCC has also placed personnel in North and southern Sumatra, Halmahera, Timor, Sulawesi, and West Kalimantan. See also Jakarta; Java; Kudus; Pati; Salatiga; Semarang; Yogyakarta. Indonesia, formerly the Dutch East Indies, since 29 December 1949 a republic (1950 population, 80 million; 2005 population, 242 million), a group of islands in the Malay Archipelago in the Indian and Pacific oceans, of which Java (pop. 127 million and area 50,000 sq. mi.) is the most densely populated tropical country, although Sumatra (pop. 40 million and area 163,557 sq. mi.) is larger. The Dutch Mennonites, who had previously supported the mission work of other denominations, opened a mission in Java in 1847, which was extended to include Sumatra in 1871 among the Battak. This was the first Mennonite mission among non-Christian peoples, which was followed by other missions established in the last quarter of the 19th century by American Mennonite bodies. Out of this mission work developed two Mennonite Conferences in eastern Java, the Malay Church with 11 congregations, a membership of 2,410, and a Bible school at Pati, and the Chinese Church with 9 congregations and a membership of ca. 1,500 in the mid-1950s. There was also a small Mennonite church in Sumatra with 101 members in four places. Jensma, Th. Doopsgezinde Zending in Indonesia. The Hague: Boekcentrum, 1968. Kraybill, Paul N., ed. Mennonite World Handbook. Lombard, IL: Mennonite World Conference, 1978: 145-156. McVey, Ruth. Editor. Indonesia. New Haven, CT: HRAF Press, 1967. Mennonite World Conference. "2000 Asia/Pacific Mennonite & Brethren in Christ Churches." Web. 2 March 2011. http://www.mwc-cmm.org/Directory/2000asiapacific.html http://www.mwc-cmm.org/Directory/2000asiapacific.html. [Broken Link]. Mennonite World Conference. "Mennonite and Brethren in Christ Churches Worldwide, 2006: Asia & Pacific." Web. 2 March 2011. http://www.mwc-cmm.org/Directory/2006asiapacific.pdf http://www.mwc-cmm.org/Directory/2006asiapacific.pdf. [Broken Link]. Mennonite World Conference. "Mennonite and Brethren in Christ Churches Worldwide, 2009: Asia & Pacific." 2010. Web. 25 October 2010. http://www.mwc-cmm.org/en15/files/Members%202009/Asia%20&%20Pacific%20Summary.doc http://www.mwc-cmm.org/en15/files/Members 2009/Asia & Pacific Summary.doc. [Broken Link]. Mennonite World Conference. "MWC - 2003 Asia/Pacific Mennonite & Brethren in Christ Churches." Accessed 2 March 2006. http://www.mwc-cmm.org/Directory/2006asiapacific.pdf http://www.mwc-cmm.org/Directory/asiapacific.html. [Broken Link]. Mennonite World Conference. World Directory = Directorio mundial = Répertoire mondial 2012: Mennonite, Brethren in Christ and Related Churches = Iglesias Menonitas, de los Hermanos en Cristo y afines = Églises Mennonites, Frères en Christ et Apparentées. Kitchener, ON: Mennonite World Conference, 2012: 10. Mennonite World Handbook Supplement. Strasbourg, France, and Lombard, IL: Mennonite World Conference, 1984: 33-34. Wikipedia. "Indonesia." 14 May 2014. Web. 17 May 2015. https://en.wikipedia.org/wiki/Indonesia. Yoder, Lawrence M. Tunas Kecil: Sejarah Gereja Kristen Muria Indonesia [Little Shoot: History of the Muria Christian Church of Indonesia]. Semarang: Komisi Literatur Sinode GKMI, n.d. . Also available in English translation under the title "The Church of the Muria: A History of the Muria Christian Church of Indonesia." Th.M. thesis, Fuller Theological Seminary, 1981. Yoder, Lawrence M. and Sigit Heru Soekotjo. "Sejarah Gereja Injili di Tanah Jawa" [History of the Evangelical Church ofJava]. Unpublished manuscript. Bender, Harold S. and Lawrence M. Yoder. "Indonesia." Global Anabaptist Mennonite Encyclopedia Online. May 2014. Web. 25 Apr 2019. http://gameo.org/index.php?title=Indonesia&oldid=122222. Bender, Harold S. and Lawrence M. Yoder. (May 2014). Indonesia. Global Anabaptist Mennonite Encyclopedia Online. Retrieved 25 April 2019, from http://gameo.org/index.php?title=Indonesia&oldid=122222. Adapted by permission of Herald Press, Harrisonburg, Virginia, from Mennonite Encyclopedia, Vol. 3, pp. 31-32; vol. 5, pp. 436-438. All rights reserved. This page was last modified on 20 May 2014, at 04:12.